PROCEQ – the inventor of Leeb rebound hardness testing – has applied its many years of experience to produce a new instrument with unique features, allowing convenient hardness testing for a large variety of metal pieces on site. Stationary hardness testers can only accommodate test pieces of limited size. Moreover, transportation of the test pieces is often impractical. The robust Equostat 3 works well in outdoor, factory, and lab environments, and has very few requirements on test piece geometries. The new Equostat 3 probe can be connected directly to a laptop or a PC; alternatively, the probe can be plugged into the powerful Equotip 3 indicating device. 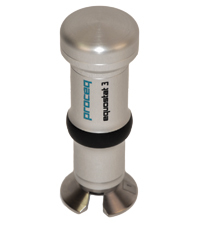 The Equostat 3 offers unique user guidance to achieve reliable measurements. The small indentation size qualifies the instrument as an NDT technique. The Equostat 3 method conforms to DIN 50157 and ASTM B724 test standards. Hardness conversions are in accordance with ISO 18265 and ASTM E140. The instrument is supplied with a robust carrying case, a test block, and product documentation. Additional instrument accessories are available to suit specific applications. As with all Proceq Products, sales and full service support is available from Proceq’s global locations in Asia, the Americas, Europe, Middle East and Russia. The Equostat 3 comes with a 24-month warranty on all electronic parts. When purchasing the instrument, the buyer is also offered the possibility to purchase extended warranty coverage.